Illustration of a Herculanean dancer. From: Ottavio Baiardi. The antiquities of Herculaneum. London: S. Leacroft, 1773. Although Johann Joachim Winckelmann may not be a household name today, his influence on British art, design, and architecture was profound. 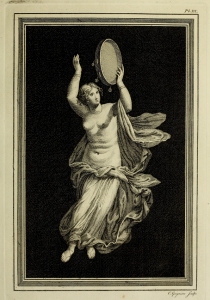 Our new exhibition, ‘From Italy to Britain: Winckelmann and the spread of neoclassical taste’, tells the story of his contribution to the revival of classical arts and culture in Britain in the 18th and 19th centuries. In this post, Professor Amy Smith, one of the exhibition curators, explains how Winckelmann’s discoveries in Italy influenced and inspired generations of British artists, craftsmen and architects. Like many antiquarians of his day, Johann Joachim Winckelmann (1717–1768) first learned about the Classics through immersion in literature. As a teacher then librarian in his native Germany, Winckelmann encountered the ancient world primarily through literary texts, as well as the souvenirs—coins, gems and figurines—Grand Tourists and other travellers had brought north from their visits to Italy. Once he arrived in Rome, where he rose to prominence at Prefect of Antiquities in the Vatican, Winckelmann studied the remains of Greek, Graeco-Roman and Roman art on a larger scale. Through personal contacts, letters and other writings, Winckelmann influenced his and subsequent generations of scholars, aesthetes, collectors, craftsmen and artists both within and beyond Italy. The judgment of Paris. From: John Flaxman. The Iliad of Homer. London: Longman, 1805. Winckelmann’s influence came to Britain through decorative designs in country houses that copied the style of wall paintings found in the excavations at Pompeii and Herculaneum, on which he had reported. 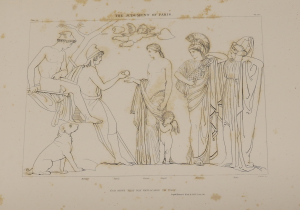 His influence is also visible in John Flaxman’s adaptations of classical and neoclassical images in drawings that illustrated the works of Homer and reliefs that decorate Josiah Wedgwood’s jasperware. 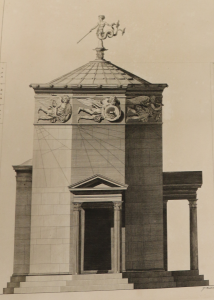 Winckelmann’s writings also encouraged an interest in Greek architecture and architectural sculpture, which was copied and adapted, for example, in Oxford’s Radcliffe Observatory. The upper story of this remarkable building, designed by Henry Keene in 1772 and completed by James Wyatt in 1794, copies Athens’ octagonal Tower of the Winds, with reliefs that emulate Wedgwood’s jasperware friezes. The Tower of the Winds. From: James Stuart and Nicholas Revett. The antiquities of Athens. London: Haberkorn, 1762-94. In the next generation architects continued to incorporate Hellenising elements into monuments such as Reading’s Simeon Monument (designed by Sir John Soane in 1804) and Oxford’s Ashmolean Museum (designed by Charles Robert Cockerell in 1845). The latter incorporates casts of the original friezes for the Temple of Apollo Epikourios at Bassae, the originals of which were found by Cockerell and acquired by the British Museum. Knowledge of Greek architectural reliefs in the British Museum was disseminated on a smaller scale through engravings and miniature casts designed, manufactured and sold by John Henning (1771–1851). 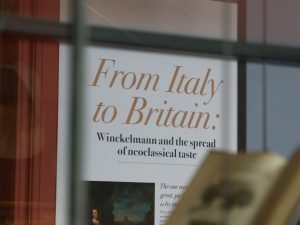 The exhibition at Special Collections, From Italy to Britain: Winckelmann and the spread of neoclassical taste, displays some of Winckelmann’s letters, 18th–19th century printed volumes and drawings and relevant artefacts, ancient and modern, that illustrate Winckelmann’s broad influence. The exhibition, a collaboration of University of Reading’s Ure Museum of Greek Archaeology (www.reading.ac.uk/ure) with Special Collections, runs from 15 September through 15 December 2017. For information on opening hours and how to find us, please see our website. #ReadaBookDay – Our top suggestions! 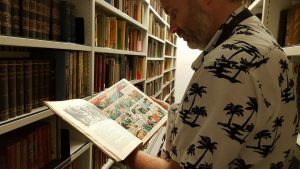 In celebration of #ReadABookDay, members of staff at The MERL and Special Collections have been sharing their favourite books from within our collection on Twitter. This blog post looks in a bit more depth at our selections (beyond the 140 character limit). and three annuals. Created in 1950, Eagle comics were created by Marcus Morris, an Anglican vicar who was disillusioned with children’s literature at the time. The comics ran from 1950 to 1969, and included the iconic character Dan Dare, iconic pilot of the future. The comic holds nostalgic value for many readers, including David, who can remember rereading old copies of Eagle when he was a young boy. Translated into The Conspiracy of Catiline and Jugurthine War, Erika’s choice comes from one of the earliest Roman historians. This particular copy was printed in the late 15th century by Aldus Manutius, an influential figure in early Venetian printing. The reason Erika chose this book, however, is because it includes a large number of drawings and doodles within the margins. 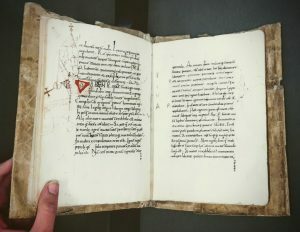 The study of marginalia within books has become an important aspect of reception studies and book history, and provides an insight into the character of historical readers. however, is one of the 900 works which are pre-1851. 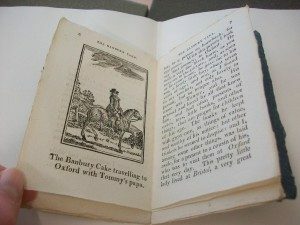 Titled The history of a Banbury Cake: an entertaining book for children, the book is based around a talking Banbury cake, and it’s subsequent adventures from Oxford to Bristol. You can find more about Banbury from our previous blog here, alongside a further look at cakes within the Special Collections. 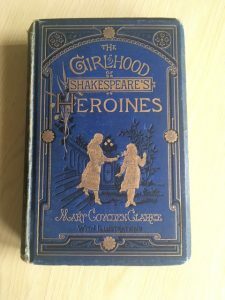 Bethan is one of our newest recruits to Special Collections, but she has already picked out a possible favourite- The girlhood of Shakespeare’s heroines by Mary Cowden Clarke. Clarke was often a partner with her husband Charles Clarke in various Shakespearean studies (Marshall & Thompson 2011). The girlhood of Shakespeare’s heroines was previously maligned by critics as supposedly focusing upon Shakespeare’s female characters as actual people, rather than literary creations. However, more recent research has shown Clarke’s writings to be more subversive and feminist then previously thought (Brown 2005). A previous English Literature student, Bethan liked the focus on Shakespeare’s female characters, and the illustrations included throughout the book. If you’re interested in any of the items mentioned here, please feel free to contact us for more information! We hope we’ve inspired you to pick out your favourite books. Brown, S. A. (2005) “The Prequel as Palinode: Mary Cowden Clarke’s Girlhood of Shakespeare’s Heroines,” in Holland, P. (ed.) Shakespeare Survey. Cambridge: Cambridge University Press (Shakespeare Survey), pp. 95–106. Marshall, Gail, & Thompson, Ann (2011) ‘Mary Cowden Clarke’, in Gail Marshall (ed. ), Great Shakespeareans volume 7.